FABER Group Bhd, a healthcare support services group, expects revenue contribution from its property division to fall this year as the economic slowdown hits housing demand. It plans three new launches this year, with a total gross development value (GDV) of RM392 million, given the right market conditions. One of the projects comprises 31 link-villas and three bungalows on 3.4ha in Taman Desa, Kuala Lumpur. It plans to launch the development, with estimated GDV of RM75 million, by the fourth quarter. The other two are Phase 1A of a joint venture with the Kuala Lumpur City Council (DBKL) in Taman Desa and Phase Four of its Laman Rimbunan development in Kepong, Selangor. The Phase 1A project consists of 40 semi-detached houses and six bungalows, with a GDV of RM98 million. Phase Four of the Kepong project features 150 semi-detached houses and three bungalows, with a GDV of RM219 million. "Both projects are targeted to be launched by the third quarter of this year, subject to market conditions," Faber Group managing director Adnan Mohammad said. The group is also exploring the possibility of tying up with banks to offer stimulus packages. Last year, the property division accounted for 23 per cent of the group's revenue, with the rest contributed by its integrated facilities management (IFM) business for hospitals. "This year, we expect to see a dip in (contribution from) the property division, but it will be compensated by higher IFM activities, especially with our venture into the United Arab Emirates (UAE) and India," Adnan said after the group's annual general meeting in Kuala Lumpur yesterday. Faber Group is targeting this year's revenue to increase 12-14 per cent from RM668.5 million last year. Its overseas contribution is expected to double to 10 per cent this year after it clinched two contracts in the UAE worth RM66 million and another IFM project in India, which will contribute RM18 million revenue. Faber Group has 17.2ha of undeveloped land with a GDV of RM900 million and unbilled sales of RM752 million. SIME Darby Property Bhd saw more than RM600 million worth of properties being sold during the third instalment of its Parade of Homes promotion, which was launched on March 6 2009. This translates to a sale of over 900 properties in the developer's 10 townships. The campaign, which covers both residential and commercial units, will end on June 15. Two of the most popular Sime Darby Property's townships, Bukit Jelutong and Putra Heights in Selangor, have also enjoyed good take up rates for the products launched during the latest Parade of Homes promotion. The Selangor State Development Corp (PKNS) plans to take control of a local real estate investment trust (REIT) within the next six to 12 months to grow its business. It is learnt that the state property arm is eyeing a listed REIT with total assets valued at more than RM600 million. General manager Othman Omar said PKNS was negotiating to buy a controlling stake. He declined to name the REIT. "We hope to seal the deal by the end of this year. We want REITs to be one of our tools to grow," he told Business Times in an interview in Petaling Jaya. PKNS will inject a slew of properties it owns into the REIT to double the size to over RM1 billion, Othman said. It is targeting Wisma PKNS, Kompleks PKNS, the 500,000 sq ft Shah Alam City Centre mall and the Shah Alam convention centre. PKNS will include a few shopping malls it is setting up in its new developments in the Klang Valley as well as the 27-storey Menara Worldwide office tower in Jalan Bukit Bintang, owned by its wholly-owned unit, Worldwide Holdings Bhd (WHB). "We plan to reap the best benefits during this crisis to position ourselves. This is the best time to get skilled workers, cheaper land and assets," Othman said. PKNS has put in place key performance indicators for all departments as part of efforts to increase its revenue and net profit. It aims to achieve a record RM1.06 billion revenue this year. It also wants to double profit margins to 40 per cent by scrapping negotiated tenders and replacing them with open tenders. "PKNS has a responsibility for making profits, which can be channelled back to the state. We will look at all avenues to grow, but cautiously," Othman said. PKNS, which has 4,000ha of undeveloped land in the Klang Valley, is looking at tying up with Selangor state arms Kumpulan Hartanah Selangor Bhd, Perbadanan Kemajuan Pertanian Selangor and Permodalan Negeri Selangor Bhd to develop their landbank. MALAYSIA Airports Holdings Bhd (MAHB) is in the midst of hiring consulting and architecture firms to help build the new permanent low-cost carrier terminal (LCCT) at the KL International Airport (KLIA) in Sepang. Senior general manager of operations Datuk Azmi Murad said construction works should start by year-end. He, however, did not say if MAHB had started accepting bids for the construction. 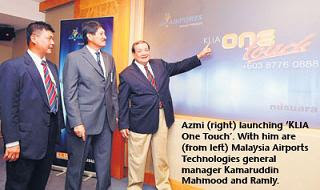 Azmi was speaking after the launch of a flight information speech system called "KLIA One Touch" in Sepang yesterday. MAHB managing director Datuk Seri Bashir Ahmad said last month that the airport operator was confident of completing the new LCCT and a new runway in two-and-a-half years once work starts. He estimated that the development cost would not exceed RM2 billion. The new LCCT can handle up to 30 million passengers a year, with the capacity for expansion of up to 45 million passengers. Azmi said total passenger arrivals at the KLIA and the current LCCT dropped 0.6 per cent to 8.7 million arrivals year-on-year in the first four months of 2009. During the January-April period, there was a 16 per cent drop in passenger traffic at the KLIA to 4.7 million, but this was offset by a 31 per cent growth at the LCCT. Nevertheless, Azmi said he is happy because there has been no cancellations arising from the influenza A (H1N1) outbreak. "People are cautious of travelling. If they need to, the option is to go for a lower cost of travel. That's why there's negative growth at the main terminal. But I don't see any contraction due to the H1N1 outbreak," he added. Users can now get flight information directly from KLIA One Touch by calling 03-8776 0888. The 24-hour system is a self-service interactive voice response provided by NuSuara Technologies Sdn Bhd, a subsidiary of the Minister of Finance Inc.
For arrival flights, queries can be made based on either flight number or flight's origin city. For departures, queries can be made based on flight number or flight's destination city. "KLIA One Touch is capable of handling 30 calls at any one time with two language options available - Bahasa Malaysia and English," NuSuara chief executive officer Datuk Dr Ramly Abbas said.